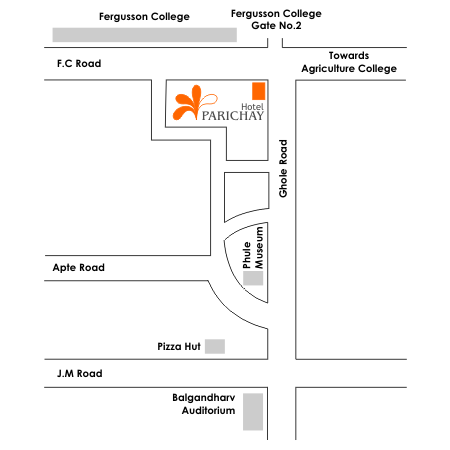 Contact Us : Our goal is to make your stay at Hotel Parichay an enjoyable & rewarding experience. Let us know how we can assist you. 1199/1A, Fergusson College Road, Pune : 411004, Maharashtra, INDIA. 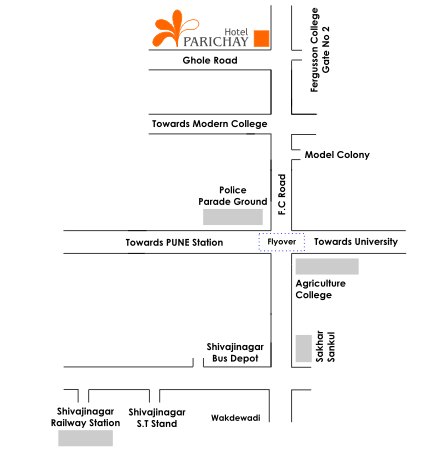 Our Location : Hotel Parichay is located in the central zone of Pune. Prominently situated on The Fergusson College Road, in the Deccan area of Pune the main shopping and financial areas and enjoys easy access to both Railway Station and International airport. Our Unique location puts you in close proximity to business organisations, educational Institutions, places of historic and tourist importance and entertainment & shopping malls.